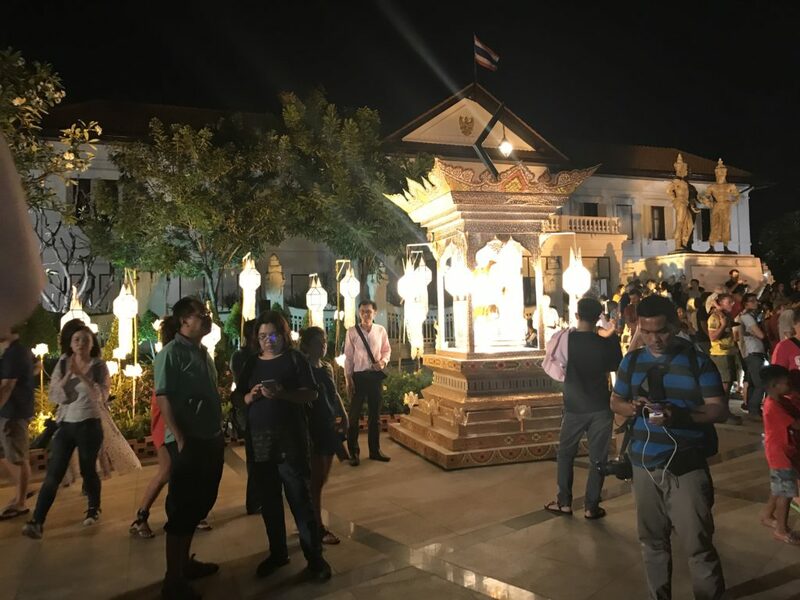 The Loy Krathong festival is one of the biggest events of the year in Chiang Mai. It is a Siamese festival, that is held in Thailand and many of the surrounding countries. It is usually held sometime in October or November, on the full moon of the 12th month of the Thai Lunar calendar. So in the Western calendar the dates differ each year. Loy Krathong means ‘decorative floats’. Floats are traditionally made from banana leaf with candles, incense and sometimes money in the centre. When you set them off into the water, bad luck is supposed to float away with them. It is also seen as a way to honour the water goddess Phra Mae Kong Ka (the Thai form of Ganga – Hindu goddess of the river Ganges). 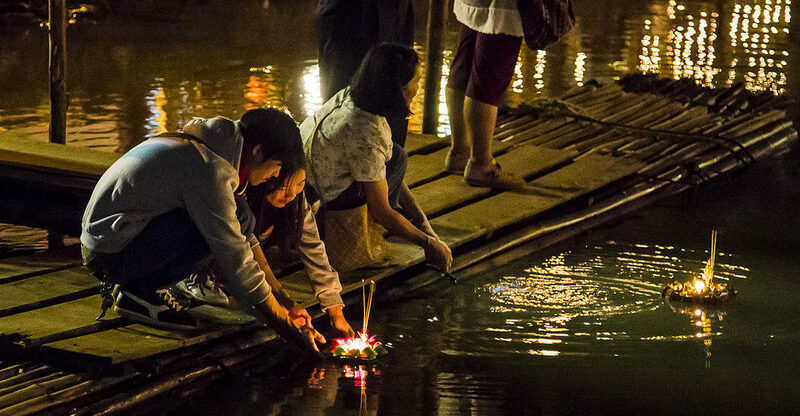 In Chiang Mai, Loy Krathong is coupled with Yee Peng (or Yi Peng) – the festival of lights. It’s a lovely couple of days in Chiang Mai with very beautiful and colourful sights. More on Yee Peng in my next post! 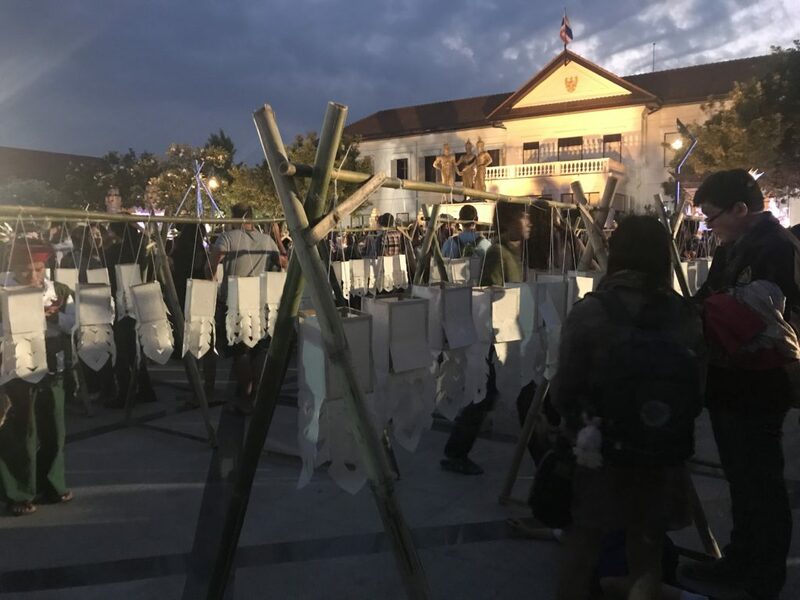 The Loy Krathong opening ceremony occurred at 6pm in Chiang Mai old town, at the square between the three kings statue and the Lanna Folklife museum. Driving into Chiang Mai old town isn’t easy at the best of times. It’s a square 1.5km across, surrounded by a moat. There are only a few bridges across the moat. We arrived close to 6pm, and surprisingly managed to park within walking distance. I love this part of going to festivals! As we were walking towards the action we started seeing more and more people walking the same way. There was a great vibe in the city – everyone we saw seemed happy and excited. 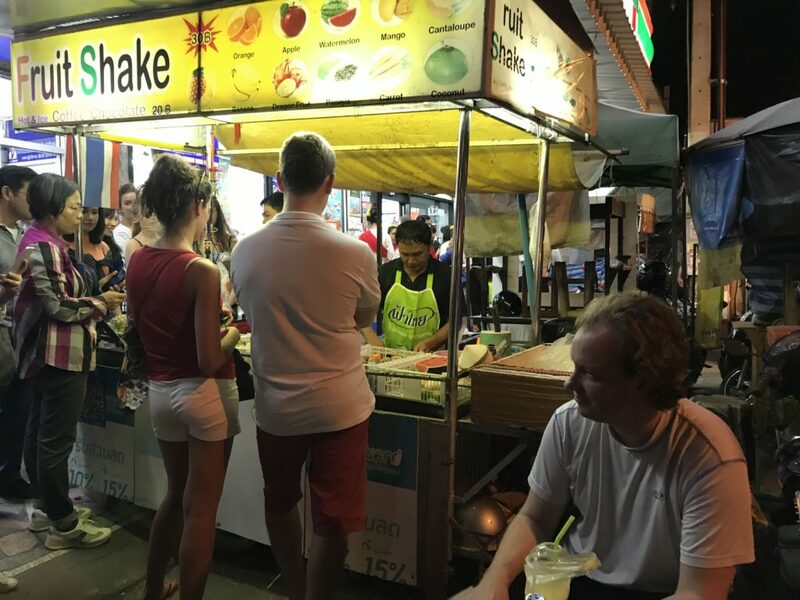 There were also more and more food stalls popping up along the way. 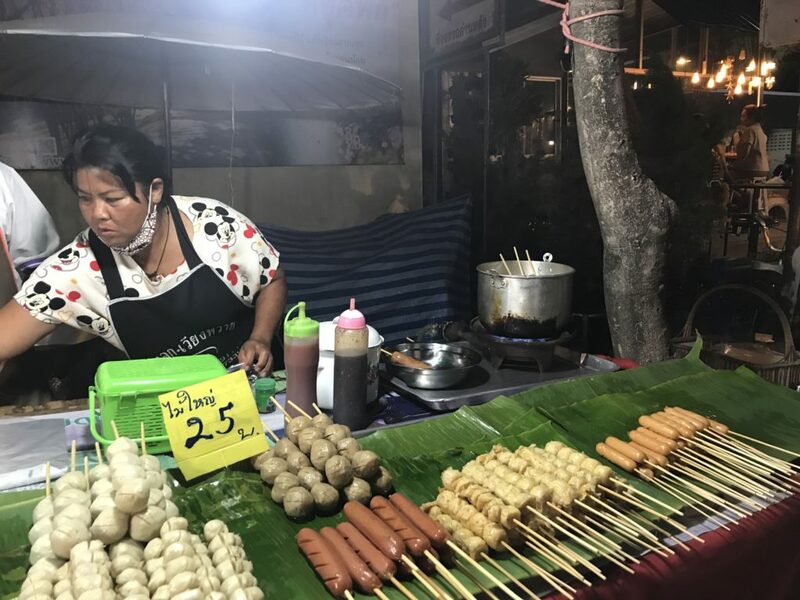 You certainly never need to worry about going hungry in Thailand. All food stalls can be packed up and moved using motorbikes. So if something’s going on, you can usually find smoothies, grills, fruit, noodles and random things cooked in banana leaves. The square was packed! It was also beautiful. The whole area was decorated with lanterns. We entered through an archway covered in paper lanterns. At this point they weren’t lit – the square was lit by floodlights. Later on everything would be lit up. In front of the three kings monument, a monk was chanting the opening ceremony. Unfortunately we couldn’t understand it, and there was no translation. Still, the vibe in the square was awesome. No one seemed to mind the buzz of activity during the sermon. People were walking round, chatting, taking photos, making things at stalls. 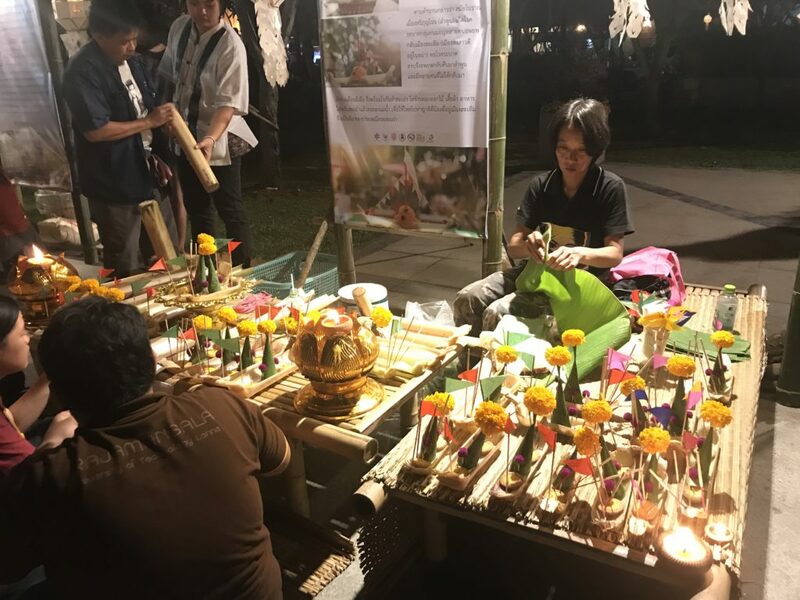 Around the outside, there were stalls making and selling the elements used in the celebrations – floating baskets, lanterns, candles. In the centre, were wooden structures hung with hundreds of small paper lanterns. Dancers from the Lanna Folklife museum waited in the centre. After the opening sermon, they would perform a traditional dance. People waited around them to get good spots for the dance. We obviously couldn’t with a slightly cranky 2 year old who should’ve been in bed! We would’ve watched more of the activity, but Jack was dragging us everywhere! Still, as festivals with small children goes, this one was good. There was no problem with noise and plenty to see. We just had to be willing to explore at his pace. Then the dancers stood up and performed a traditional folk dance. Unfortunately, we couldn’t get close. The dance looked very beautiful, but also solemn. It involved moving slowly to a drum beat. Jack pulled us away before too long. On the other side of the square, there was a stage for the’Mr and Mrs Yee Peng’ contest. Beauty pageants are common in Thailand. You can watch a video of some of the dance here. If we didn’t have small children to put to bed we’d have definitely stayed. Stopping off for some smoothies and Dim Sum, we made our way home. 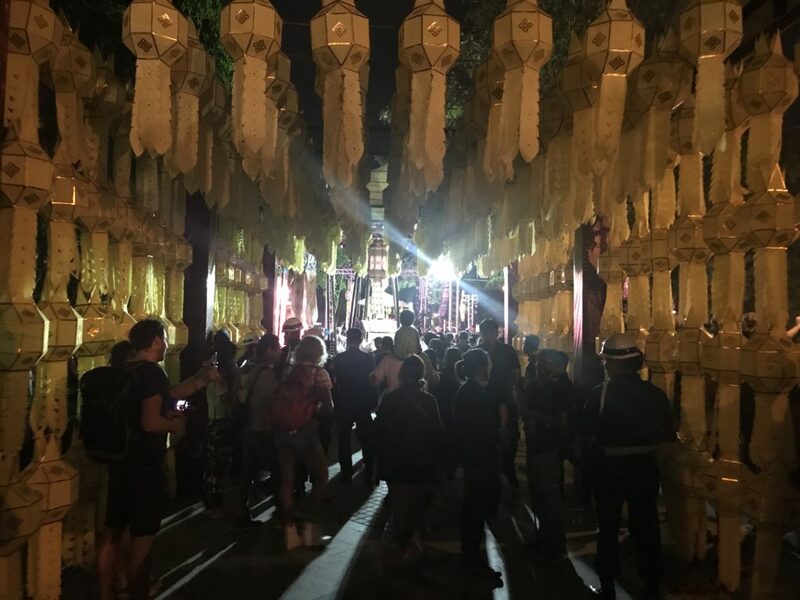 In Chiang Mai, the Yee Peng festival and the release of Sky Lanterns is held around the same time as Loy Krathong. Read about our trip to Yee Peng here.